How to create a woocommerce discount on the first order or the nth order? A discount on the first order is the most effective way to convert a first time visitor into a paying customer. That conversion is the first and hardest step into building a good customer relationship. The next step is to turn that first time customer into a recurrent and loyal one. One of the ways to make that happen is to create different levels of discounts depending on the customer loyalty: the more he orders, the bigger discounts he will get. In today’s article, you will learn how to create a discount on the first order and a discount on the n-th order in few clicks using WooCommerce All Discounts. How to create a discount on the customer’s first order in WooCommerce? Select “If previous orders count” as condition. How to create a discount on the customer’s n-th order in WooCommerce? Nothing can be easier. Just follow the previous steps but set “Equals” as operator and ‘0’ as value, you can set the discount rule that matches your needs. 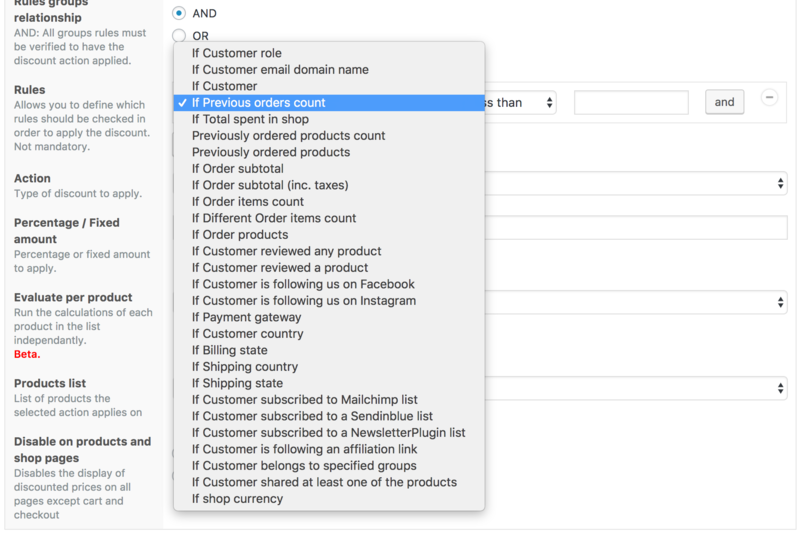 This completes our tutorial on the creation of discounts on first orders and discounts on n-th orders using WooCommerce All Discounts. If you have any questions, use the comments section to ask.